In Spring, 1888, newspapers announced that six-year-old Annie Redmond was missing. She and her friend Otto had been playing in a lot near her home at 26th and State. They were approached by a stout woman in a yellow dress and black hat. “Is your mother home, little girl?” she asked. “Come along with me and I’ll buy you some candy,” said the woman. 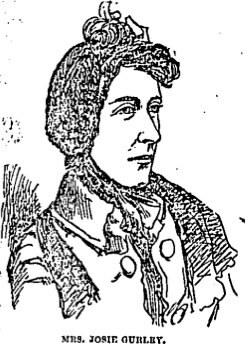 In the trial, the story came out: the kidnappers had taken Annie and, the papers said, “abused her shamefully.” (and for a paper in 1889 to say a child had been abused, it must have been bad). She was kept in a Throop street cellar with her arms tied to her side, and occasionally dressed as a boy. Annie took the stand herself to testify. “Do you remember the lady who took you away?” asked an attorney. “Did they ever let you go out? The Parsons apparently didn’t realize Annie had been kidnapped, and were actually let go without trial. Harvey Gurley, the husband, was also apparently duped. He had married Josie only recently, and she had told him once that she was going to bring a former stepdaughter home. When her mother said that she was “joking” about ever having been married, Harvey asked Josie why should would say such a thing, and she admitted that she’d never been married – she had an illegitimate child. The next day she brought Annie home and told her husband that she was her daughter. He admitted he’d whipped her a couple of times, and tied her in the basement to scare her, but this wouldn’t have been considered illegal at the time. He was genuinely baffled to find out that the child had been kidnapped. Josie Gurley was given the remarkably light sentence of five years in prison. There was never really much follow-up about the story of Annie Redmond. There was no “ten years later” story, no story on the affair when Annie got married years later. Once the trial ended, the story did, too. But there were a couple of twists. When her sentence was announced, Josie made an odd remark about Annie’s father, saying “I have not told one-half about John Redmond yet.” She may have been lying, of course, but three years later, John Redmond went nuts and murdered Dr. FM Wilder. He came to be known as “the crazy blacksmith,” and his own story will require a whole new post. And three years after that, the story was revived again when it the crimes of H.H. Holmes came to light. There was never anything to connect Holmes with the story, and he denied any knowledge of it, but plenty of people noticed that Annie had been kept within spitting distance of the “murder castle” site, though construction on it was just beginning at the time, and not much of Holmes’ whereabouts from 1888 are really known (which helps fuel the theories that he was Jack the Ripper). Exactly which drug store she was sent to is not known, but it’s quite possible that it was the store Holmes took ownership of on Sixty-Third Street.